Intense Debate is a commenting system which is designed to inspire conversation. Including such features as threaded comments (allowing readers to reply to each other in comment threads), avatars and a voting system, many Blogger users are now choosing this as an alternative to the default Blogger commenting system. What Are the Main Features of Intense Debate? Threaded comments, which allow commenters to reply directly to each other and be visible as a comment "heirachy"
You can read about these features in full detail, or watch the two minute video of Intense Debate functionality which explains this service in a snap! It is surprisingly easy to install Intense Debate commenting in your Blogger template! Even when I tried this method for non-standard and highly customized templates, I found this method worked just fine. If your blog is hosted on Blogspot (eg: yourblog.blogspot.com), Intense Debate will automatically detect your blogging platform. If you use a custom domain (eg: www.yourblog.com), you will need to choose Blogger as your blogging platform. Here you have the choice of installing Intense Debate comments as a widget (the easy method) or directly in your Blogger template, to appear below your posts (the recommended method). If you choose to add this as a widget, simply click on this option and follow the steps to add this as a widget in your blog sidebar. If you would prefer to use the full commenting system, continue reading instead! Installing the full Intense Debate commenting system really is a breeze! 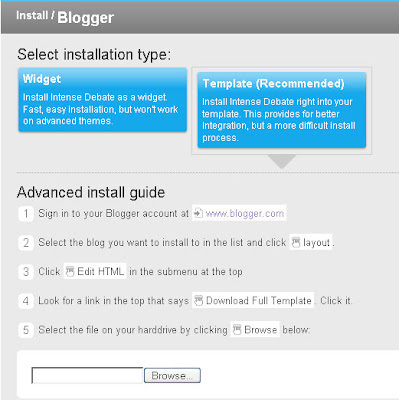 In this case, you will need to follow the steps provided on the installation page to make a back-up of your full Blogger template by going to Layout>Edit HTML in your Blogger dashboard, and clicking on the "Download full template" link. This saves a copy of your existing blog template (including any widgets and customizations) to your computer. Once you have done this, go back to the Intense Debate installation screen and click the "Browse" button to locate your template file on your computer. Choose to replace all comments with Intense Debate comments instead. If you do choose to replace all comments, these existing comments will not be lost! You can retrieve and import these to Intense Debate afterwards if you choose to do so (as shall be explained shortly). Check the radio selection for the option you prefer, then click the "Upload file and continue" button. On this next screen, you will see a box filled with code. This is your Blogger template code which has been modified to include the Intense Debate commenting system. Copy all of the code in this box to your clipboard. Then go to Layout>Edit HTML in your Blogger dashboard. Replace all of your existing template code with this modified code from Intense Debate. You can check that you have installed this correctly by previewing your changes. If the installation was successful, you will receive no error notifications and can proceed to save your template. Finally, click on the "Finish" button right near the bottom of the Intense Debate installation page. Then visit your blog in your web browser to check out your new commenting system! Once you have installed Intense Debate comments in your Blogger blog, you may like to change some of the settings to suit your individual requirements. To change your Intense Debate settings, you will need to access your Intense Debate dashboard and click on the "settings" link for the blog you wish to access. Blog Info: Here you can alter any details for your blog, such as the URL, blog title and RSS feed. Comment Posting: This section includes any moderation opions you may wish to alter. You can choose to moderate all comments before they appear beneath your blog posts; moderate posts containing words in a blacklist, and even automatically delete comments if they contain certain "banned" words and phrases. Email Notifications: Choose whether you would like an email to be sent to blog authors whenever a new comment is posted (similar to Blogger's comment settings). Display Settings: If you would like to enable "threads" (this allows a person to comment directly to another commenter), tick the appropriate box. You can also set the default order of comments (readers will be able to re-order this list for themselves if they choose). Comment Link Text: In this section you can choose to alter the text used for your comment links. By default this is set to Comments ([#]) where [#] is the number of comments. You could change this to "[#] Responses", "Observations: ([#])" or indeed any other link text which you prefer! Add another blog admin: This setting allows you to add new moderators who can access your Intense Debate settings, which is useful for group bloggers. When you first install Intense Debate comments, you will notice the color scheme and fonts match those already present in your template! This is lucky since Intense Debate do not recommend that you alter the CSS for your comments (this is still in beta, the code used may alter and render such changes invalid). There are however a few changes you can make from within your Intense Debate dashboard. To access these layout settings, go to your Intense Debate dashboard and click on the "Layout" link for the blog layout you wish to alter. Comment Size: This setting means you can alter the avatar and font size for each comment as "compact", "normal" or "large". Comment Layout: This option enables you to change how comments appear beneath your posts. The default setting is for comments to be permanantly displayed beneath each post. Alternatives include "peekaboo comments" (activated by clicking on the comment link), and comments in a pop-up page. Most bloggers choose the default (comments already present beneath posts) setting, which is also my personal preference as clicking on a link adds another step for readers and offers less incentive for actually leaving a comment on your posts. If you choose to install Intense Debate for all your existing blog posts (including those posts which already have comments) you may prefer to import any existing comments from Blogger to be displayed alongside your new Intense Debate comments. Importing your old comments is very easy. Simply go to your Intense Debate dashboard and click on "Overview" for the blog whose comments you wish to import. Next click on the "Blog Tools", then on the "Import Comments" link in the left hand column. On this page, you will be prompted to log in to your Blogger account, which will allow Intense Debate to access the API for importing your comments. Once logged in, you will be able to choose which blog you wish to import from and to (be sure to import/export comments from the same blog, otherwise Intense Debate will not be able to allocate them to the correct posts!). When you choose to import these comments from Blogger, the existing comments will not be deleted! If you decide to uninstall Intense Debate for any reason, you can export all your Intense Debate comments to an XML file, and restore the view of your existing Blogger comments. I'm not sure that it's possible to export Intense Debate comments back to Blogger at this time as Blogger's API does not allow comments to be automatically created using such third party software (though I strongly suspect it may be possible for respected services like Intense Debate to do this in the future). One of the more useful functions of Intense Debate is profiling. By using your Intense Debate profile to leave comments on ID-enabled blogs, you can increase your reputation, link to your other social networking profiles, add an avatar and monitor comments left on all blogs you visit! Readers can vote comments up or down (depending on their perceived value to the conversation). Comments which are voted up increase that commenters reputation (whilst the reverse also applies too). From my experiences is using Intense Debate so far, I am happy to say that there are very few possible problems which could occur. While testing Intense Debate installation with both default and heavily customized (third party) Blogger templates, I have only found two possible problems which may occur during installation: imported comments may not appear as soon as they are imported, and the comment count on heavily customized templates may not appear. First of all, check the comments in your Intense Debate dashboard to ensure these do appear for the appropriate blog (if not, you should attempt to import them again). If the imported comments are present, chances are that Intense Debate has not caught up with these comments yet. Be patient, and soon enough you should notice these comments appear in the Intense Debate comment area beneath your posts. If after a day or so the imported comments do not appear, you should ask for help in the forum. This forum is watched by members of the Intense Debate team who seem very helpful and will be able to help you resolve this problem quickly. I've only ever noticed this problem occur in heavily customized templates where the comment count appears near the top of each post, rather than in the post-footer section. I suspect this problem may occur because the comment-link tags is separated from other elements of the comments section, and is not parsed correctly by Intense Debates (otherwise flawless) installation system. The fix for this problem is a little more complicated, but not too difficult. Firstly, backup your existing template code (to ensure you can restore your template if thhere are any problems). Finally, save your template. If this was successful, you should see the comment count appear on your posts which relates to the true number of comments (whether Intense Debate or Blogger generated comments). Again, backup your existing template to restore if there are problems using this method. Then save your template and check to make sure the comment count appears in your blog posts. If you are still experiencing problems with your Intense Debate comments, the best advice I can offer is to visit the forums where members of the Intense Debate team will be on hand to assist you with your problems. Do you already use Intense Debate? Or are you considering using this free service as an alternative to Blogger's default commenting system? If so, please let us know your own opinions of Intense Debate comments by leaving your comments below.